It's my friend Fiddledeedee's curriculum round-up! It's where we talk about the curriculum and structure we're using this year to educate the young minds around our house. I've been meaning to write up a beginner's review of our new curriculum, so this is the perfect opportunity to kill two birds with one stone. You know, if I wanted to kill birds. Which I don't. My first step in deciding our curriculum for this year was an honest evaluation of last year. Last year was a slacker year. For the kids and for me. I tried a looser approach to homeschool and I had great aspirations at the beginning of the year for more interactive, unit-based learning. More projects, less worksheets. More student-led, less confined to what some book said we had to do next. 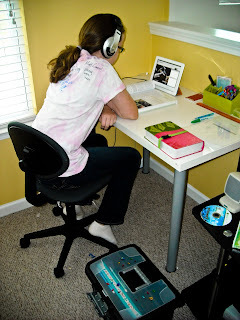 The fun stuff other homeschool families talk about doing all the time. It didn't go quite like I thought. We got through the year, we learned things, and everyone did very well on their tests, but it wasn't our best effort. All that looser structure means much more work on mom's part to plan and gather outside resources and keep everyone moving forward. I wasn't really into all that. For this year, I knew that I needed to go back to something more structured for everyone's sake. We'd done A Beka in various forms in the past and it had worked well for us, but the kids had decided they didn't like it. I knew the heavily structured approach was what we needed, so I offered them the Bob Jones curriculum. Same idea, different format. They fought it, too, but I pulled out my secret weapon. I took them with me to the curriculum presentation. Bob Jones became a shiny new toy. They got to see the sample videos, flip through the books, click around on the site and see the calendar and blog functions. And they got free homeschool t-shirts when we ordered. They went from "No!" to "How soon can we start?!" L's first day of school was the last Thursday in July. K was off at camp, L had numerous dance commitments the next week, and I wanted a chance to focus on one kid at a time while we all learned this new curriculum. It was the best decision ever. L and I watched all her classes together and figured out the best way to organize all the books and manipulatives as Bob Jones 2nd grade has a ton of both. K joined us on Monday and I could focus on her work. K is 10. Most kids her age are in 5th grade, K started under a late cut-off and is technically in 6th grade, but she complained so much about how easy all her work was that we gave her 7th grade work this year. It's all very confusing. In practicality, it means that her work this year is hard and takes a long time. There's a big jump from elementary to middle school and she's really not happy that school has suddenly gotten a lot more difficult. Do you want to see what our school looks like? We do school up in the loft and I'm "school" enough that I make the kids sit at desks. My biggest concern was having 2 kids watching school videos just a few feet from each other. Mr. at Home solved the problem with big, puffy headphones which K uses most of the time and L uses only when I make her. I warned the girls that I was taking pictures and if they didn't want the whole internet to see their usual mess then they needed to clean off (and around) their desks. So yes, these photos are a bit staged, but at least it was good motivation to clean their desks! Here's K in her corner. Her desk is generally pretty clean and she has been known to lean so far forward in her chair that she slides off. On the other side of the TV is L's desk. Her desk took lots of cleaning (and her hair took lots of brushing) before she was ready for her picture. While K is trying to get closer to her work, L spends a lot of her time trying to get away from hers. Like yesterday. L spent several minutes laughing at K for sliding out of her chair only to somehow step into the trashcan and send herself and all the crumpled papers flying across the room. It's like a circus full of clowns around here some days. In a couple of weeks, all of our other activities will be going strong. K is in band and Science Olympiad, both the girls are doing dance, and all three of us are doing Community Bible Study. We're back in a local homeschool support group and we've got a number of field trips already lined up for the next few months. It's going to be a busy, full, and fun year. After 3+ weeks of the BJU Press online, here's what I see. - It takes a looong time to do everyday. We used to be done by lunch and now the girls are working into the afternoon most days. - There's lots of papers to check. - L learned cursive in kindy with A Beka and has beautiful thin, slanted handwriting. BJU teaches a very simple, round pre-cursive handwriting that morphs into a babyish cursive later in the year. The curriculum demands so much more in every other subject and L was frustrated at first, but it is improving her printing, so we're sticking with it. - The daily "What do I need for each lesson" is organized by course rather that by lesson and some courses number lessons from 1 - 170 and some list it by chapter and section, such as 02-08. The student log-in has checkmarks to show which lessons you've completed, but you can't see those with the parent log-in, so it's harder to figure out which lesson they're on. - Did I mention all the papers I have to check? - Teaching. Time spent giving explanations and examples and great stories and fun puppets and cute skits and actor-portrayals. We didn't spend as much time on that last year and it's making a difference. Yes, it makes school longer, but they are understanding and retaining the information much better. - Lots of practice. All those worksheets and papers that I complain about grading means they are trying out their learning and I can make sure they're getting it. They also learn how to stick to something until it's done right even if they don't necessarily enjoy it. - Higher expectations. BJU moves quick and expects more of the girls than I would doing it myself. - Plenty of parent involvement without being completely parent-driven. - It's on-line. It's easy to see log in what they're doing and everything I need is right there. There's the answer documents and little videos just for mom explaining what the teacher is covering each day and all kinds of extras. - It's more college prep than most of the other stuff I've seen. So far, Bob Jones is working for us. I'm really liking it and I think the girls like it more than they'll admit. It's not as "fun" as other options, but they're learning much more with this one. It's been a steep learning curve with figuring out how everything works, but I think we've got it down and running smoothly now. I am glad we started in plenty of time to work out the kinks *before* all our other school activities start. I wouldn't recommend Bob Jones for everyone. It's a demanding, time-consuming curriculum for both parent and child. My kids are both smart and self-motivated which is perfect for this curriculum. If your child works slowly and whines every time he is required to put pencil to paper, this curriculum will drive you both batty. If he takes longer to grasp concepts, you will want a curriculum that allows more flexibility of timing. If you need something portable or you're on the go a lot, you'll find this confining. However, if you and your kids need structure and accountability and challenge, this is a great option. 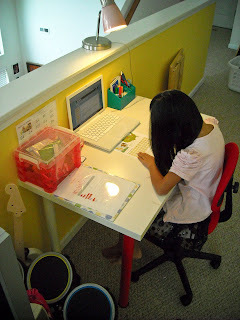 To read about more homeschools and the way they do things, go to http://www.fiddledeedee.net/2011/08/18/curriculum-round-up-2011/ and follow the linky! Ditto to DeeDee's comment. Many days I have weighed the pros/cons of the online route. We may do some of those in the next four years of high school as those classes become more challenging than some of my skill sets. At least ther are options!